DEATH BLOW: SUPREME COURT RULING MAY "UTTERLY DEVASTATE OBAMACARE!" Though a 2012 Supreme Court ruling upheld Obamacare as a legal tax on the American people, the nation’s highest court is preparing to hear arguments on the Federalized health care legislation once again. The latest case targeting the Affordable Care Act focuses on the subsidies that were supposed to be given to Americans who signed up for the plans, but because numerous states refused to set up their own exchanges the subsidies now fall on the federal government, something that was not authorized under the original legislation and is therefore, according to opponents of Obamacare, illegal. At issue in this case is the legality of subsidies offered to help millions of low- and middle-income people buy health insurance. Opponents argue that most of the subsidies are illegal. Though just a technicality, it’s a big one. There are tens of billions of dollars involved and with a Republican run Congress soon to take over any possible amendments to the law are unlikely. This doesn’t bode well for the Affordable Care Act, because a ruling in favor of the plaintiffs will essentially deal a death blow to the entire law. President Barack Obama’s administration maintains this argument is baseless and that Congress always intended these subsidies to be available nationwide. What’s at stake is that the five million Americans who depend on the subsidies in order to have health care stand to have their full rates re-instituted because their subsidies have been given to them without any legal basis. And while the Obama administration claims that Congress always intended to make these subsidies available to everyone, Congress failed to detail this very important item within the law itself. Should the Supreme Court rule against federal Obamacare subsidies the Affordable Care Act would fall apart almost instantly, as five million low-income Americans would see their health premiums jump nearly $3000 per year, making it too costly for just about everyone who depends on the subsidies. Obamacare, it seems, is now under serious threat of being completely destroyed. The argument from opponents of the legislation boils down to one single point: why should middle- and high-income earners be responsible for covering the health care costs of others? While low-income families have experienced significant cuts in their premiums, and in some cases even free health care, middle-class Americans have seen their rates triple or even quadruple. Obamacare was sold to the American public as an Act that would provide affordable insurance to all. In that regard it has been an abject failure. While many Americans have, in fact, seen their premiums cut to affordable levels, millions of others have been left without healthcare because the government says they make too much money. Moreover, millions of younger Americans have opted out of the healthcare option altogether and prefer to pay the associated tax penalties instead. The whole idea is predicated on the notion that you can indefinitely take from Peter to pay Paul. But eventually Peter is going to run out of money and not be able to foot the bill, or he’ll simply refuse to buy into the scheme altogether. Like everything else government, the new health care initiative will be a complete and utter failure. The basic principles of mathematics will prove this to be true in coming months and years. As Denninger notes, America will be “strangled and expire economically as a direct consequence” of the marriage of the State and Health Care industry. 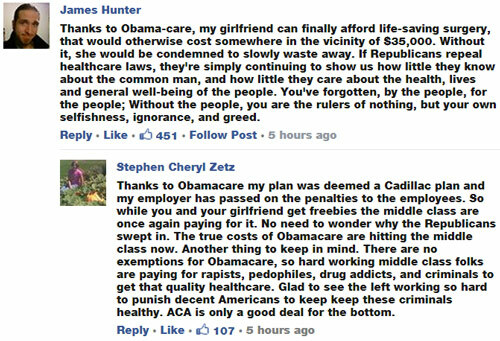 Obamacare, it seems, is doomed to failure one way or the other. With the threat of subsidies being taken away the legislation would likely collapse in the next few months and Americans may be spared the impoverishment that is sure to come with incredibly high health insurance premiums and taxes. If the Supreme Court rules against the illegal federal subsidies, then the move could well deal a death blow to one of the most massive socialized actions in American history. Good riddance. The ruling can’t come soon enough.